Optimum nutritional support for the health of the entire equine Gastro Intestinal tract. Pro G.I. is a high specification Gut balancer that supports the entire digestive tract. It helps maintain normal healthy intestinal mucosa, gut microflora & correct pH balance. Lecithin: A source of phospholipids, which support the health of the stomach lining at the cellular membrane level, nourishing the cell membranes of the digestive tract and helping protect the stomach from the damaging effects of excess acid. Lecithin can also help reduce levels of excitability and anxiety associated with digestive distress. Pectin: Forms a gel which helps support the delicate gastric mucosal lining of the stomach. Beta Glucans (derived from yeast): Feeding Beta Glucans can help counteract pathogenic microbes, moderate the release of sugars from the digestive system in the bloodstream and help boost immunity. 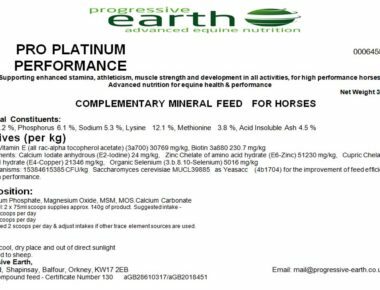 ACIDBUF (Calcareous marine Algae): A Gentle Slow releasing buffering agent to help in the prevention & solution of acidosis problems in horses & ponies. Has a longer buffering action than limestone flour or sodium bicarbonate. Whey protein isolate: Assists in ensuring a horse’s own natural synthesis of glutamine is maintained. Glutamine supports a healthy digestive lining. Whey protein is an excellent source of essential amino acids; Including Threonine, which supports production of mucin, a necessary component of the mucus that lubricates and protects the gut lining. Vistacell: A live yeast product of the Saccharomyces cerevisiae variety. VistaCell supports healthy gut microflora and helps maintain correct pH balance. Support the entire digestive tract. Support the health of the stomach lining. Help maintain healthy digestive system during periods of heavy work/stress/illness. Help maintain a healthy immune system. Protect the stomach from the damaging effects of excess acid. Help reduce behaviour problems associated with digestive distress. Help moderate the release of sugars from the digestive system. Horses with digestive upset, loose droppings. Feeding rate: 30g per 100kg of body weight. 1 scoop holds approximately 75g of product. 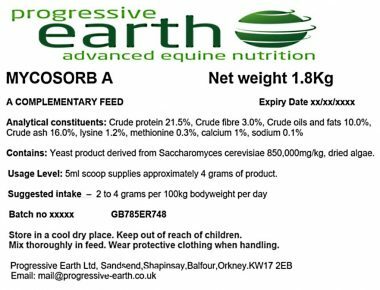 Average 500kg horse: 2 x 100ml scoops (150g) per day. As with all new supplements introducing gradually. Feed at full dose for a minimum period of 15 days. Crude Fat 18%, Crude Fibre 1.5%, Ash 35%, Acid Insoluble Ash 2.3%. Micro-Organisms: 166666666667 CFU/kg Saccharomyces cerevisiae MUCL39885 as Vistacell (4b1710). Composition: Lecithin, Algae, Whey Protein Isolate, Pectin, Yeast and Peppermint. Pack size and availability: Progressive Earth Ltd Pro G.I. 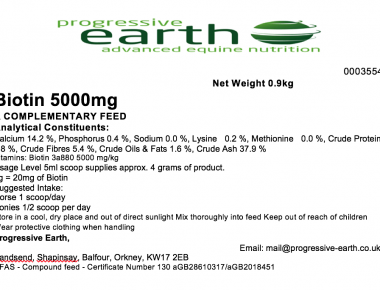 equine feed supplement is available in resealable grip seal pouches containing 2.25 Kg of product. 3 reviews for PRO G.I. Optimum nutritional support for the health of the entire equine Gastro Intestinal tract. This supplement has transformed my horse Louie. All bloating has gone, head shaking stopped, generally happier and at 25 he looks absolutely fantastic on it. Thank you Mel, another brilliant product. One of my horses often gets diarrhoea when he changes fields or hay, and I found that feeding him PRO GI around the change really alleviated the problem. I gave it to all of my horses when they first moved from winter to summer grazing, and there were firm poos all round, none of the usual cow pats!